Arrow Pest Control has been in the “Pre-Construction Termite Treatment” business for over 50 years and still going strong today! Pre-construction Termite Treatment is also referred to as a “Pre-Treat.” Most new structures in the United States are treated against termites during the initial construction process. What Exactly is Pre-Construction Termite Treatment? Arrow Pest Control has been in the “Pre-Construction Termite Treatment” business for over 50 years and still going strong today! Pre-construction Termite Treatment is also referred to as a “Pre-Treat.” Most new structures in the United States are treated against termites during the initial construction process. 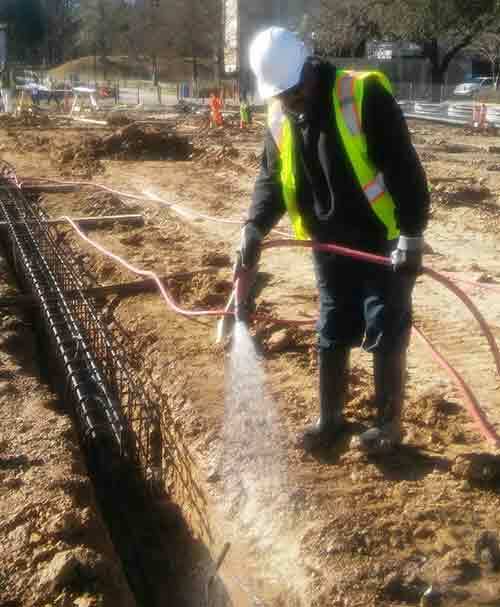 The common treatment consists of termiticides being applied to the soil before the slab is poured. This is done as a means of blocking concealed access of subterranean termites (not dry wood termites) to a structure. The preventative cost of a Pre-Construction Treatment is minimal in comparison to the monetary damages termites can cause a home after it is built! Every full termite Pre-Construction treatment Arrow performs comes with a renewable damage warranty for the new property owner. Soil Treatment: Arrow will pretreat the soil before the concrete slab is poured. This is the most common method of termite pretreatment for new construction projects. Borate Treatment: Arrow will treat the wood studs of the structure at the dried-in stage of construction. This product is a good alternative to a soil treatment, and also considered a green termite treatment. Termi-mesh: Termi-mesh is a green physical termite barrier commonly applied to the piping penetrations right before the concrete slab is poured. This finely woven mesh will last the lifetime of the structure, and termites cannot penetrate this high quality stainless steel barrier. Termi-mesh, in most cases, can only be used as as add-on termite service and not a stand alone treatment for new construction projects. Sentricon Baiting System: The Sentricon system is installed around the perimeter of the structure once all the landscaping is completed for your new construction project. The system is monitored yearly and is available for new construction projects and existing structures. I shopped around a decent amount before choosing a pest control company. These guys are very competitively priced, but also have amazing service!